Alpine Animal Doctors is committed to a high standard of client and patient service. Various legislation requires that a veterinary hospital collects and accurately maintains some personal information relating to our clients and patients. The provision of quality veterinary healthcare therefore requires a relationship between a veterinary hospital and its clients based on trust and confidentiality. 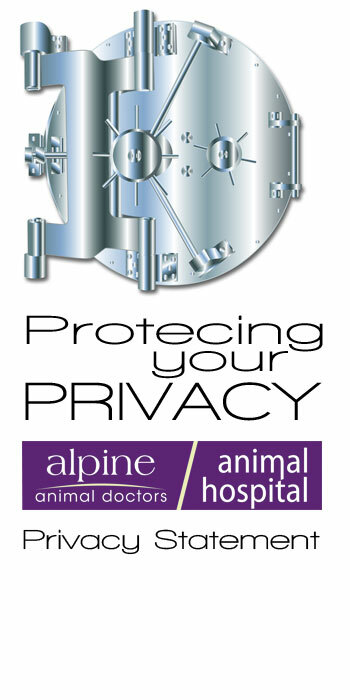 Consistent with our commitment to quality care Alpine Animal Doctors has developed a policy to protect client privacy and comply with privacy legislation. Our policy has been developed in response to the Privacy Amendment (Private Sector) Act 2000 and our practice has adopted the ten National Privacy Principles contained in that Act. provide a system for you to have access to any personal information we may hold. Most aspects of our website at www.alpinevet.com.au can be viewed without providing any personal information. However, for certain features, or for access to future Alpine Animal Doctors‘ customer support features, you may be asked to submit personally identifiable information. This may include your name, phone numbers, email address, a unique username and password, or the provision of sensitive information to aid in the recovery of your lost password. For each visitor to our website we collect some standardised non-personally identifiable information, including but not limited to browser type, version and language, operating system, pages viewed while browsing the site, page access times and referring website address. This statistical information is used internally solely for the purpose of analysing website visitor traffic and trends. You cannot be identified from this information. It is important to us that your expectations about the way in which we handle your information are the same as ours. Please do not hesitate to discuss any concerns, questions or complaints about any issues related to the privacy of your personal information with a member of our staff or contact Dr. Rebekah Day in writing. If you would like more information about privacy legislation please contact the Privacy Commissioner on 1300 363 992 or visit www.privacy.gov.au.